Among the numerous victims of the persecutions of Hadrian, tradition names ten great teachers who suffered martyrdom for having, in defiance of an edict of the Roman emperor, instructed their pupils in the Law. They are referred to in haggadic literature as the 'Asarah Haruge Malkut. 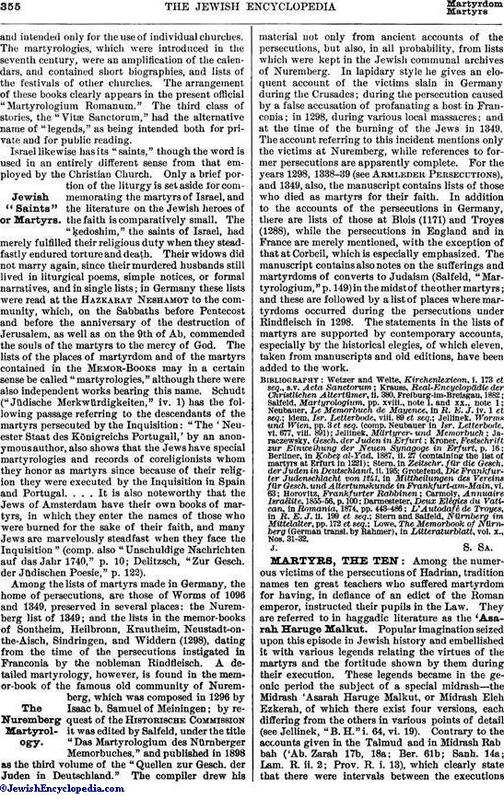 Popular imagination seized upon this episode in Jewish history and embellished it with various legends relating the virtues of the martyrs and the fortitude shown by them during their execution. These legends became in the geonic period the subject of a special midrash—the Midrash 'Asarah Haruge Malkut, or Midrash Eleh Ezkerah, of which there exist four versions, each differing from the others in various points of detail (see Jellinek, "B. H." i. 64, vi, 19). Contrary to the accounts given in the Talmud and in Midrash Rab bah ('Ab. Zarah 17b, 18a; Ber. 61b; Sanh. 14a; Lam. R. ii. 2; Prov. R. i. 13), which clearly state that there were intervals between the executionsof the ten teachers, the Midrash 'Asarah Haruge Malkut, probably in order to produce a greater effect upon the mind of the reader, describes their martyrdom as occurring on the same day. This midrash differs from the older sources in regard also to the accusation upon which they were condemned. It says that when a certain Roman emperor who had been instructed in the Law came to the Biblical passage, "And he that stealeth a man, and selleth him, or if he be found in his hand, he shall surely be put to death" (Ex. xxi. 16), he conceived the following mischievous device: He summoned Ishmael ben Elisha (perhaps the propounder of the "Thirteen Rules"; see Ab. R. N., ed. Schechter, p. 54b; comp. Ned. ix. 10), Simeon (certainly not Simeon ben Gamaliel II; see Ta'an. 29b), Ishmael, Akiba ben Joseph, Hananiah ben Teradion, Ḥuẓpit (the interpreter ["meturgeman"] of the Sanhedrin of Jamnia), Yeshebab (the secretary of the Sanhedrin), Eliezer ben Shammua' (in Midr. R. l.c. "R. Eliezer Ḥersanah," or "R. Tryphon"), Hananiah ben Ḥakinai (in Midr. R. l.c. "Judah ha-Neḥetam"),and Judah ben Baba, and demanded of them what was the punishment prescribed by the Law for stealing a man. They answered, "Death"; whereupon the emperor said, "Then prepare to die, for your ancestors [alluding to the history of Joseph and his brethren] committed such a crime, and you, as the representatives of the Jewish nation, must answer for it." The rabbis asked for a delay of three days that they might ascertain, by invoking the Ineffable Name, whether the punishment pronounced against them was ordained by Heaven. Ishmael ben Elisha, in his capacity as high priest, or as the son of a high priest, was chosen to make the inquiry, and after having ascertained that it was decreed by Heaven, the rabbis submitted to their fate. Ishmael and Simeon were the first to be taken to the place of execution, where a dispute arose between them as to which should be executed first, each desiring to precede the other in order that he should be spared the sight of the martyrdom of his colleague. Thereupon the emperor ordered lots to be cast, and the lot fell on Simeon, whose head was stricken from his body with a sword. Ishmael was flayed; he suffered with great fortitude, and began to weep only when his executioners reached the place of the phylacteries. The third victim was Akiba, whose flesh was torn off with a carding-implement. While undergoing the torture he recited the Shema' with a peaceful smile on his face. Astonished at his extraordinary courage, his executioner asked him if he was a sorcerer that he could so easily overcome the pain he was suffering, to which Akiba replied, "I am no sorcerer, but I rejoice that I am permitted to love God with my life." He died at the last words of the Shema'—"God is One." The fourth martyr was Hananiah ben Teradion, who was wrapped in a scroll of the Law and placed on a pyre of green brushwood; to prolong his agony wet wool was placed on his chest. "Wo is me," cried his daughter, "that I should see thee under such terrible circumstances!" "I should indeed despair," replied the martyr, "were I alone burned; but since the scroll of the Torah is burning with me the Power that will avenge the offense against the Law will avenge me also." His disciples then asked: "Master, what seest thou?" He answered: "I see the parchment burning while the letters of the Law soar upward." His disciples then advised him to open his mouth that the fire might enter and the sooner put an end to his sufferings; but he refused to do so, saying, "It is best that He who hath given the soul should also take it away: no man may hasten his death." Thereupon the executioner removed the wool, fanned the flame, thus accelerating the end, and then himself plunged into the fire. 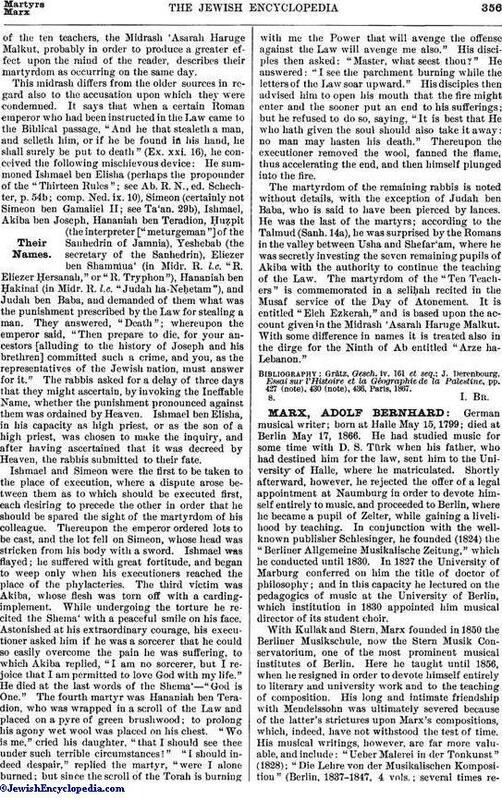 The martyrdom of the remaining rabbis is noted without details, with the exception of Judah ben Baba, who is said to have been pierced by lances. He was the last of the martyrs; according to the Talmud (Sanh. 14a), he was surprised by the Romans in the valley between Usha and Shefar'am, where he was secretly investing the seven remaining pupils of Akiba with the authority to continue the teaching of the Law. The martyrdom of the "Ten Teachers" is commemorated in a seliḥah recited in the Musaf service of the Day of Atonement. It is entitled "Eleh Ezkerah," and is based upon the account given in the Midrash 'Asarah Haruge Malkut. With some difference in names it is treated also in the dirge for the Ninth of Ab entitled "Arze ha-Lebanon." J. Derenbourg, Essai sur l' Histoire et la Géographie de la Palestine, pp. 427 (note), 430 (note), 436, Paris, 1867.